Don Rackey has been the Director of Sports Therapy and Owner of USA Physical Therapy since 1986. 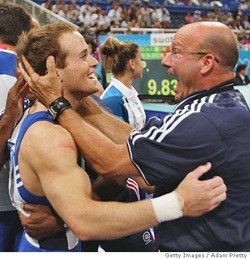 He is also a part of the USA Men's Gymnastics Team medical staff. He has over 30 years of experience treating athletes at the recreational, high school, college, professional, and Olympic levels. He is proud to have been part of the medical staff for the 2004, 2008, and 2012 Olympics in Athens, Beijing, and London, respectively. Don with Paul Hamm in the 2004 Olympics after Paul won the gold!